Recent studies have indicated that adoptive immunotherapy with autologous antitumor tumor-infiltrating lymphocytes (TILs) following nonmyeloablative chemotherapy mediates tumor regression in ∼50% of treated patients with metastatic melanoma, and that tumor regression is correlated with the degree of persistence of adoptively transferred T cells in peripheral blood. These findings, which suggested that the proliferative potential of transferred T cells may play a role in clinical responses, led to the current studies in which telomere length as well as phenotypic markers expressed on the administered TILs were examined. TILs that were associated with objective clinical responses following adoptive transfer possessed a mean telomere length of 6.3 kb, whereas TILs that were not associated with significant clinical responses were significantly shorter, averaging 4.9 kb (p < 0.01). Furthermore, individual TIL-derived T cell clonotypes that persisted in vivo following adoptive cell transfer possessed telomeres that were longer than telomeres of T cell clonotypes that failed to persist (6.2 vs 4.5 kb, respectively; p < 0.001). Expression of the costimulatory molecule CD28 also appeared to be associated with long telomeres and T cell persistence. These results, indicating that the telomere length of transferred lymphocytes correlated with in vivo T cell persistence following adoptive transfer, and coupled with the previous observation that T cell persistence was associated with clinical responses in this adoptive immunotherapy trial, suggest that telomere length and the proliferative potential of the transferred T cells may play a significant role in mediating response to adoptive immunotherapy. Recent clinical trial results have demonstrated that cell transfer therapy with autologous antitumor tumor-infiltrating lymphocytes (TILs)4 following a conditioning nonmyeloablative chemotherapy regimen can cause the regression of large, vascularized tumors in patients with refractory metastatic melanoma (1, 2). Tumor regression in some patients was accompanied by a large in vivo expansion of the administered antitumor lymphocytes, which represented >70% of the total lymphocytes in peripheral blood for more than 5 mo after transfer. Sequence analysis of TCR β-chain V region gene (TRBV) products expressed in the administered TIL samples, tumor samples, and PBMC samples obtained from the treated patients demonstrated that there was a significant correlation between tumor regression and the degree of persistence in peripheral blood of adoptively transferred T cell clonotypes (1, 3, 4, 5). These observations lead to further consideration of the mechanisms involved with maintaining T cell persistence. Telomeres are specialized DNA-protein structures at the ends of eukaryotic chromosomes consisting in humans of 5–15 kb of tandemly repeated TTAGGG sequence with associated proteins (6). Chromosomal replication during normal cell division is incomplete and results in the loss of terminal telomeric sequences at a rate of 50–100 bp per cell division (7, 8). Telomere shortening has been observed in T cells as they differentiate from naive to memory T cells and undergo extensive expansion (8, 9). Clonal expansion of T cells in vivo during immune responses to both foreign and autoantigens has been reported to be associated with telomere shortening (10, 11). The shortening of telomeres to a critical level leads to loss of telomere function resulting in increased cell death and altered cell functions, particularly loss of replicative capacity (senescence) (9, 12, 13). The loss of telomeres that occurs with cell division can be compensated by the action of telomerase, an enzyme that can catalyze the addition of telomeric end repeats (14). T cells up-regulate telomerase upon Ag stimulation (15); however, telomerase activity decreases following repeated Ag stimulation, resulting in corresponding decreases in telomere length upon further cell division, and ultimately leading to replicative senescence (16). Studies of naive and memory T cells showed that naive T cells, which have longer telomeres, can undergo increased numbers of population doublings in vitro (17). Conversely, stabilization of telomere length in T cells after overexpression of telomerase enhances replicative capacity (18, 19). Thus, it is possible that loss in telomere length during extensive in vitro expansion may act to decrease the residual replicative capacity of TILs in vivo, impair T cell persistence, and limit responses to adoptive immunotherapy. Phenotypic markers have also been associated with cells that have undergone extensive proliferation. Markers that are up-regulated on senescent T populations include CD57 (20, 21) and the killer cell inhibitory receptor KLRG1 (22). In addition, the loss of expression of the costimulatory markers CD27 (23, 24) and CD28 (8, 25) has been found on T cells that have undergone extensive proliferation. Results presented in the current study indicated that the telomere length of the administered cells was significantly correlated with in vivo T cell persistence and tumor regression in melanoma patients. These findings suggest that the ability of adoptively transferred antitumor T cells to mediate tumor regression in vivo may be associated with their proliferative potential, and that the analysis of telomere lengths of populations of in vitro-cultured tumor-reactive T cells might facilitate the selection of TIL with enhanced in vivo efficacy. All patients in this study signed an institutional review board-approved consent and were treated with autologous TILs following lymphodepletion chemotherapy as described in detail previously (1). The techniques of TIL growth have been described in detail (26). Briefly, explants of small (2 mm3) tumor fragments or 1 × 106 viable cells of tumor tissue digests were used to initiate TIL culture in 2 ml of RPMI 1640-based medium (Invitrogen Life Technologies) containing 10% human serum and 6000 IU/ml IL-2 (Chiron). After 2–4 wk of culture, usually several million TIL cells were obtained and screened by IFN secretion assay for recognition of tumor cells. Antitumor TIL cultures were further expanded in AIM V medium (Invitrogen Life Technologies) supplemented with irradiated allogeneic feeder cells, anti-CD3 Ab (Ortho Biotech), and 6000 IU/ml IL-2. This expansion protocol typically resulted in 1000-fold expansions of cells by the time of administration 14–15 days after initiation of the expansions. All of the administered TIL secreted >100 pg/ml IFN and at least twice background in cocultures with autologous melanoma cells, allogeneic HLA-matched melanoma cell lines, or T2 cells pulsed with the dominant HLA-A2-restricted peptide epitopes MART-1:27–35 or gp100:209–217. Peripheral blood samples were obtained from the patients ∼1 wk and 1 mo following adoptive transfer of autologous TILs and PBMC were separated from the peripheral blood samples using Lymphocyte Separation Medium (MP Biomedicals). Patients underwent computed axial tomography of the brain, chest, abdomen, and pelvis before adoptive cell transfer and after the treatment. A partial response was defined as a decrease of at least 50% (but <100%) of the sum of the products of the longest perpendicular diameters of all tumors (World Health Organization Criteria) after therapy lasting at least 1 mo with no new or enlarging tumors, and a complete response required the disappearance of all lesions with the appearance of no new lesions. All patients not achieving a complete or partial response were considered as nonresponders. Analysis of in vivo persistence in the patients after adoptive transfer of autologous TILs was conducted as previously described (3). Briefly, total RNA was isolated from TILs and PBMC samples and used in the analysis of TRBV expression using 5′ RACE technique. The 5′ RACE products were analyzed by an automated DNA sequencer (ABI PRISM 3100-Avant Genetic Analyze; Applied Biosystems). The sequence data were analyzed by comparison with known TRBV sequences using Vector NTI Suite 8 (Invitrogen Life Technologies). Individual T cell clonotypes were sorted from the administered TILs using anti-PE MicroBeads (Miltenyi Biotec) for telomere fluorescence in situ hybridization and flow cytometry (flow-FISH) assay. PE-conjugated TCR Vβ Abs (Beckman Coulter) including VB1, VB2, VB3, VB4, VB5.1, VB7, VB8, VB11, VB13.1, VB14, VB16, and VB17 as well as MART-1 tetramer (Beckman Coulter) were used to separate the corresponding T cell clonotypes. The average length of telomere repeats at chromosome ends in individual T cell clonotypes was measured by quantitative flow-FISH as previously described (8). FITC-conjugated telomere probe (FITC-OO-CCCTAACCCTAACCCTAA, O indicating a molecule linking FITC to DNA sequence) was from Applied Biosystems. FITC-labeled fluorescent calibration beads (Quantum TM-24 Premixed; Bangs Laboratories) were used to convert telomere fluorescence data to molecules of equivalent soluble fluorescence (MESF) units. The following equation was performed to estimate the telomere length in base pair from telomere fluorescence in MESF units (bp = MESF × 0.495) (8). Aliquots of the SUP-T1 human T lymphoblastic leukemia cell line (American Type Culture Collection) were used as daily positive control to normalize telomere lengths. Unstained cells were included as negative controls. TIL samples were costained with FITC, PE, allophycocyanin, or biotin-conjugated Abs against phenotypic markers (see Table III⇓) and corresponding FITC or PE-conjugated TCR Vβ Abs including VB1, VB2, VB3, VB4, VB5.1, VB7, VB8, VB11, VB13.1, VB14, VB16, and VB17 as well as MART-1 tetramer (Beckman Coulter). Abs against CD8β, CD30, CD48, and CD127 were purchased from Beckman Coulter. Abs against CD27 and ICOS were purchased from eBioscience. Anti-CD102 Ab was purchased from Southern Biotechnology Associates. Anti-CD178 Ab was purchased from Alexis Biochemicals. Anti-DR3 Ab was purchased from NeoMarkers. Anti-HVEM Ab was purchased from R&D Systems. CD8αα expression was detected by TL-tetramer, a gift from Dr. H. Cheroutre (La Jolla Institute for Allergy and Immunology, San Diego, CA). Abs against the other phenotypic markers were purchased from BD Biosciences. Phenotypic marker expression was analyzed using a FACSCalibur (BD Biosciences). Data were analyzed by Mann-Whitney U test or Wilcoxon signed-ranks test, and differences were considered significant at p < 0.05. Linear regression analysis was used to determine the relationship between telomere length and characteristics of TIL and patient samples. The characteristics of autologous TILs used to treat patients with metastatic melanoma were studied to understand the mechanisms involved with maintaining T cell persistence and tumor regression. Prior studies have demonstrated that the proliferative potential of T cells was associated with telomere length (27), and an initial attempt was therefore made to determine whether telomere length of TIL was associated with their ability to persist when administered to patients and to mediate tumor regression. When the telomeres present in bulk samples of TIL were evaluated, there appeared to be a relatively narrow distribution of telomere lengths within these T cell populations (Fig. 1⇓). The telomere lengths of the administered bulk TIL were not correlated with patient age (Fig. 2⇓A) or with the length of in vitro culture before infusion (Fig. 2⇓B). The telomere lengths determined for the in vitro-cultured TIL were, however, correlated with the in vivo absolute lymphocyte counts (ALC) between 5 and 10 days following adoptive transfer (p < 0.0005) (Fig. 2⇓C) and between 19 and 37 days following transfer (p < 0.0005) (Fig. 2⇓D), whereas the ALC in the peripheral blood at these times following adoptive transfer was not correlated with the number of total transferred T cells (p > 0.1). These observations suggest that the telomere lengths of bulk-administered TIL may be related to their ability to proliferate and persist following adoptive transfer in vivo. 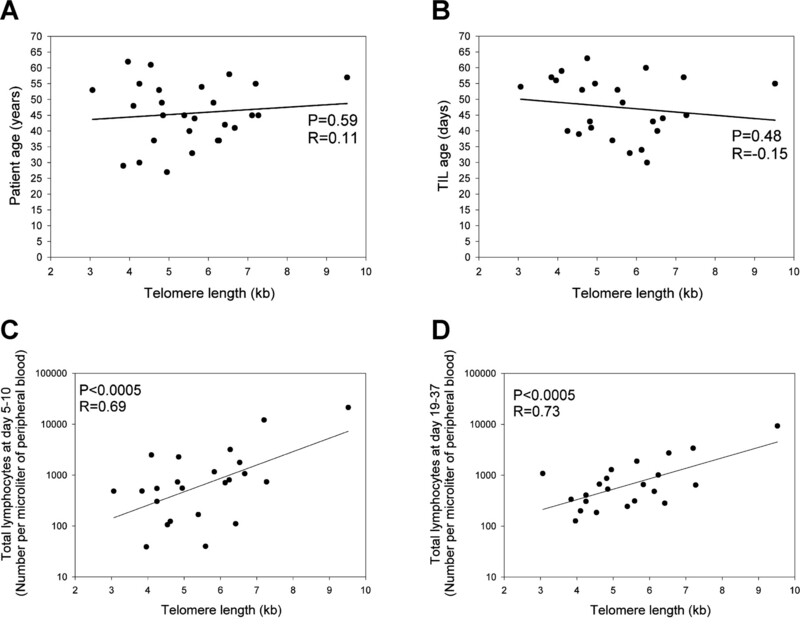 Representative histograms of telomere flow-FISH assays of bulk-administered TILs. Administered TIL samples were thawed and used in telomere flow-FISH assays without further culture. Shaded area represents the unstained control. Telomere length of administered TIL is not correlated with age of TIL or patient age but is correlated with absolute lymphocyte count. The relationship was examined between telomere lengths of the administered TIL and patient age (A), or between the telomere lengths of the administered TILs and the TIL age (B). TIL age refers to the total number of days TIL were cultured in vitro. The association between the telomere lengths of the TIL before adoptive transfer and absolute lymphocyte counts in the peripheral blood obtained between 5 and 10 days following adoptive cell transfer (C) and between 19 and 37 days following adoptive cell transfer (D) was evaluated. All TIL samples were included if their corresponding data were available. The telomere lengths of TILs that were administered to responding patients were then compared with TILs that were administered to patients who did not respond to adoptive immunotherapy. The results of this comparison indicated that the overall telomere lengths of TILs used to treat responding patients were significantly longer than those that were used to treat nonresponding patients (6.31 ± 0.37 kb compared with 4.91 ± 0.29 kb, respectively; p < 0.01; Table I⇓). Differences have been observed in the overall telomere length of T cells isolated from individual normal donors (28, 29); however, the overall telomere lengths of normal CD8+ PBMC isolated from responding patients (8.68 kb) was not significantly different from those of CD8+ PBMC cells isolated from nonresponders (8.03 kb) (p > 0.2). These observations suggest that response to therapy may be related to the proliferative potential of the adoptively transferred T cells. Previous observations indicated that TILs used to treat responding patients generally contained at least one dominant clonotype that persisted following adoptive transfer, whereas the dominant clonotypes present in TILs administered to nonresponding patients generally failed to persist (5). Analysis of the mean telomere length of individual persistent T cell clonotypes indicated that these were significantly longer than those present in the clonotypes that did not persist (6.16 ± 0.43 kb vs 4.49 ± 0.25 kb, respectively; p < 0.001; Table II⇓). Further, in six patients, all of whom responded to therapy, at least one persistent and one nonpersistent clonotype were identified in the same administered TIL population. For every case in which a comparison could be conducted between clonotypes present in an individual patient, the telomere lengths of persistent clonotypes were longer than those of the nonpersistent clonotypes, and pairwise analysis conducted for samples obtained from these patients indicated that the telomeres present in the persistent clonotypes were significantly longer than those present in the corresponding nonpersistent clonotypes (p < 0.05). Because the mean telomere length of the heterogeneous bulk TILs correlated with posttreatment lymphocyte levels in vivo (Fig. 2⇑), the association of telomere length with the degree of persistence of individual clonotypes that were observed following adoptive transfer, which may reflect their proliferative capacity, was examined. The results of this analysis indicated that the number of lymphocytes in peripheral blood corresponding to dominant persistent clonotypes was significantly correlated with the telomere length of the in vitro-cultured T cells before transfer at both between 5 and 10 days following transfer (Fig. 3⇓A; p < 0.0005) and between 19 and 37 days following transfer (Fig. 3⇓B; p < 0.005). In an attempt to more directly measure of the extent of T cell proliferation that occurred following transfer, the number of cells corresponding to persistent clonotypes that were detected in peripheral blood relative to the number of cells corresponding to those clonotypes that were initially present in the infused TIL was calculated and expressed as relative cell number in PBMC (Fig. 3⇓, C and D). The relative cell numbers were significantly correlated with the telomere length between 5 and 10 days (p < 0.005) as well as at the later time point (p < 0.01), providing direct evidence that the proliferative capacity of adoptively transferred T cells may be correlated with telomere length. Correlation of telomere length of transferred lymphocytes with in vivo T cell persistence. The telomere lengths of transferred lymphocytes were compared with the total number of persistent T cells detected in patient peripheral blood samples obtained between 5 and 10 days following adoptive cell transfer (A) and between 19 and 37 days following adoptive transfer (B). In addition, the relative number of persistent T cells that were present in peripheral blood was calculated by determining the ratio of number of cells corresponding to individual persistent clonotypes that were originally present in the administered TIL to the number of those cells detected in peripheral blood at the two time points, assuming a total cell blood volume of 4 liters. A value of 1 indicates that the number of cells present in blood was equal to that present in the TIL. The relative cell numbers were calculated between 5 and 10 days (C) and between 19 and 37 days (D) following transfer. All clonotypes that were present in the administered TILs, as determined by sequencing the expressed TRBV gene products, and that were also detected in the peripheral blood at levels of 1% or greater in either sample, were included in this analysis. Because phenotypic markers have also been associated with cells that have undergone extensive proliferation, additional studies were conducted to determine whether differences in the expression of cell surface phenotypic markers could be discerned on the persistent and nonpersistent clonotypes that had been analyzed with regard to telomere length. Pairwise analysis of T cell clonotypes from individual patients revealed that the expression of 45 markers that included costimulatory, cytokine and chemokine receptors, as well as markers associated with T cell senescence did not differ significantly between the persistent and nonpersistent T cell clonotypes (Table III⇓). Only one of the markers that were examined, CD28, appeared to be expressed at a significantly higher level on cells corresponding to persistent clonotypes than nonpersistent clonotypes (Table III⇓), although the expression of CD28 on individual clonotypes was heterogeneous and no distinct CD28-positive and -negative subpopulations could be discerned among the cells that comprised individual clonotypes. Previous studies indicated that there was a significant correlation between CD28 expression on CD8 T cells and telomere length (8, 25). In agreement with these observations, there appeared to be a weak correlation between the expression of CD28 and the telomere length of individual clonotypes within the administered TIL (p < 0.05, without correction for multiple comparisons), and the majority of the persistent clonotypes had long telomeres and expressed a relatively high level of CD28 (Fig. 4⇓). These data suggest that the in vivo persistence of adoptively transferred T cells is associated both with telomere length and CD28 expression. 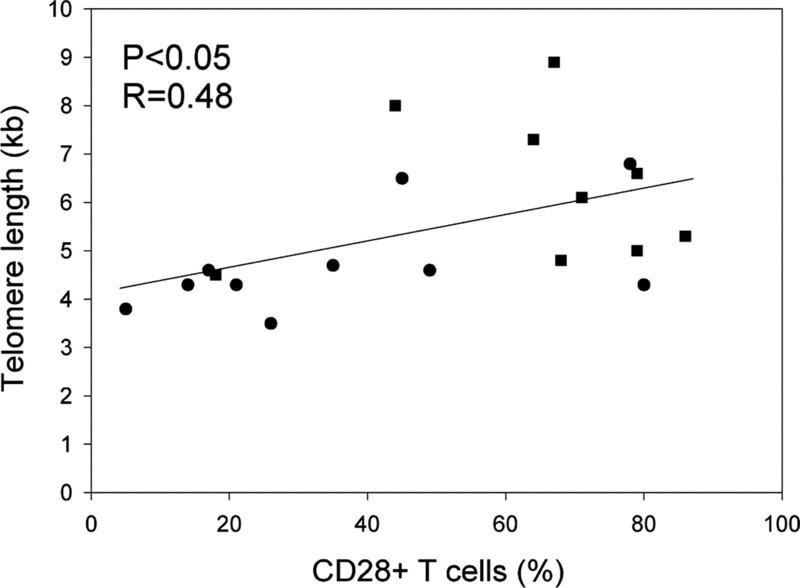 Relationship between telomere lengths and CD28 expression of transferred T cell clonotypes. The percentage of CD28 expression on cells corresponding to individual clonotypes was determined by costaining with anti-TCR Vβ Abs. Closed squares represented persistent clonotypes, and closed circles represented nonpersistent clonotypes. The results presented in this study indicate that the telomere lengths of transferred lymphocytes significantly correlate with T cell persistence in vivo following adoptive cell transfer. Our previous study demonstrated that there was a significant correlation between tumor regression and the degree of persistence in peripheral blood of adoptively transferred T cell clonotypes (1, 3, 4, 5). These data suggest that telomere length of transferred lymphocytes also correlates with tumor regression in melanoma patients after adoptive cell transfer. Thus, telomere length may represent a marker that could aid in the selection of cells used for adoptive immunotherapy. It is clear that long telomere length, however, is not sufficient to mediate tumor regression. The T cells that were administered to one of the nonresponders, patient 2037, possessed relatively long telomeres and persisted to a high degree following adoptive transfer (Table II⇑). In addition, TIL 2080, which failed to mediate significant tumor regression following adoptive transfer, possessed longer telomeres than many of the TIL from responding patients (Table I⇑). Preliminary results, however, indicate that a dominant clonotype from TIL 2080 that recognized the MART-1:26–35 epitope was highly persistent following adoptive transfer (P. F. Robbins, unpublished data). The lack of response to therapy that was observed in these patients in the face of what appeared to represent relatively high levels of persistence is unexplained, but could have resulted from tumor Ag or MHC Ag loss, as well as from loss of molecules involved with Ag processing in the tumor or with effector mechanisms required for antitumor effects. The mean telomere length of bulk TIL that were administered to patients was associated with the posttransfer overall absolute lymphocyte count (Fig. 1⇑), irrespective of the levels of T cell persistence that were observed in these patients (1, 3, 4, 5). The apparent association that was observed 1 mo following transfer was unexpected, given that for many of the patient samples analyzed, only a minority of the total populations of lymphocytes present in the blood at this time appeared to comprise the transferred T cells (Ref. 5 and P. F. Robbins unpublished data). Persistence of individual clonotypes at the tumor site may be a better indication than clonotypes in peripheral blood; however, most patients had metastases in parenchymal organs and were thus not accessible to study. It is also possible that the persistence in peripheral blood was underestimated due to the persistence of minor T cell clonotypes that were not accurately evaluated due to the limited number of sequences that were determined. Alternatively, some features of the patient environment may act to promote T cell proliferation independently of the particular T cells that were administered. Although persistence of adoptively transferred T cells following nonmyeloablative chemotherapy has been associated with clinical response, widely varying levels of persistence have been observed in responding patients. In addition, individual clonotypes that possessed relatively long telomeres in some cases demonstrated little or no persistence following adoptive transfer. A variety of factors that include tumor histology, tumor burden, as well as Ag and MHC expression could play a significant a role in the outcome of these treatments, and could potentially have an impact on the degree of persistence of individual T cell clonotypes. The lack of clinical responses observed in patients who received cells that possessed telomeres shorter than 4 kb, however, may indicate that possession of relatively long telomeres represents an important factor that may be required for the proliferation as well as persistence of cells in vivo. Activated T cells up-regulate telomerase expression (30), and ectopic expression of the human telomerase reverse transcriptase gene in human CD8-positive T cells has been shown to result in telomere elongation and extension of lifespan (19, 31, 32). The results of previous studies have indicated that signaling through CD28 may lead to enhanced telomerase expression (27, 33), and a weak but potentially significant association was noted in the current study between CD28 expression and the persistence of individual clonotypes. The levels of telomerase expression in TIL are now being evaluated in an attempt to address this issue. Prior observations, taken together with the findings presented in this report, indicate that overexpression of telomerase could potentially enhance the in vivo persistence and the efficacy of cell transfer therapies in cancer patients, although again, this may not be sufficient in all cases to lead to the persistence of tumor-reactive T cells and any associated clinical responses. Nevertheless, analysis of telomere length may provide a means to identify more effective TILs for adoptive immunotherapy and suggests that the proliferative potential of the transferred TIL is an important factor influencing T cell persistence and tumor regression. ↵1 This research was supported by the Intramural Research Program of the NIII, National Cancer Institute, Center for Cancer Research. ↵3 J.Z. and X.S. contributed equally to this work. ↵4 Abbreviations used in this paper: TIL, tumor-infiltrating lymphocyte; TRBV, TCR β-chain V region gene; flow-FISH, fluorescence in situ hybridization and flow cytometry; MESF, molecules of equivalent soluble fluorescence; ALC, absolute lymphocyte count. Dudley, M. E., J. R. Wunderlich, P. F. Robbins, J. C. Yang, P. Hwu, D. J. Schwartzentruber, S. L. Topalian, R. Sherry, N. P. Restifo, A. M. Hubicki, et al 2002. Cancer regression and autoimmunity in patients after clonal repopulation with antitumor lymphocytes. Science 298:850.-854. Dudley, M. E., J. R. Wunderlich, J. C. Yang, R. M. Sherry, S. L. Topalian, N. P. Restifo, R. E. Royal, U. Kammula, D. E. White, S. A. Mavroukakis, et al 2005. Adoptive cell transfer therapy following non-myeloablative but lymphodepleting chemotherapy for the treatment of patients with refractory metastatic melanoma. J. Clin. Oncol. 23:2346.-2357. Zhou, J., M. E. Dudley, S. A. Rosenberg, P. F. Robbins. 2004. Selective growth, in vitro and in vivo, of individual T cell clones from tumor-infiltrating lymphocytes obtained from patients with melanoma. J. Immunol. 173:7622.-7629. Zhou, J., M. E. Dudley, S. A. Rosenberg, P. F. Robbins. 2005. Persistence of multiple tumor-specific T-cell clones is associated with complete tumor regression in a melanoma patient receiving adoptive cell transfer therapy. J. Immunother. 28:53.-62. Robbins, P. F., M. E. Dudley, J. Wunderlich, M. El-Gamil, Y. F. Li, J. Zhou, J. Huang, D. J. Powell, Jr, S. A. Rosenberg. 2004. Cutting edge: persistence of transferred lymphocyte clonotypes correlates with cancer regression in patients receiving cell transfer therapy. J. Immunol. 173:7125.-7130. Blackburn, E. H.. 1991. Structure and function of telomeres. Nature 350:569.-573. Harley, C. B., A. B. Futcher, C. W. Greider. 1990. Telomeres shorten during ageing of human fibroblasts. Nature 345:458.-460. Rufer, N., W. Dragowska, G. Thornbury, E. Roosnek, P. M. Lansdorp. 1998. Telomere length dynamics in human lymphocyte subpopulations measured by flow cytometry. Nat. Biotechnol. 16:743.-747. Hodes, R. J., K. S. Hathcock, N. P. Weng. 2002. Telomeres in T and B cells. Nat. Rev. Immunol. 2:699.-706. Reed, J. R., M. Vukmanovic-Stejic, J. M. Fletcher, M. V. Soares, J. E. Cook, C. H. Orteu, S. E. Jackson, K. E. Birch, G. R. Foster, M. Salmon, et al 2004. Telomere erosion in memory T cells induced by telomerase inhibition at the site of antigenic challenge in vivo. J. Exp. Med. 199:1433.-1443. Wagner, U. G., K. Koetz, C. M. Weyand, J. J. Goronzy. 1998. Perturbation of the T cell repertoire in rheumatoid arthritis. Proc. Natl. Acad. Sci. USA 95:14447.-14452. Blackburn, E. H.. 2001. Switching and signaling at the telomere. Cell 106:661.-673.
de Lange, T.. 2002. Protection of mammalian telomeres. Oncogene 21:532.-540. Greider, C. W., E. H. Blackburn. 1985. Identification of a specific telomere terminal transferase activity in Tetrahymena extracts. Cell 43:405.-413. Weng, N. P., B. L. Levine, C. H. June, R. J. Hodes. 1996. 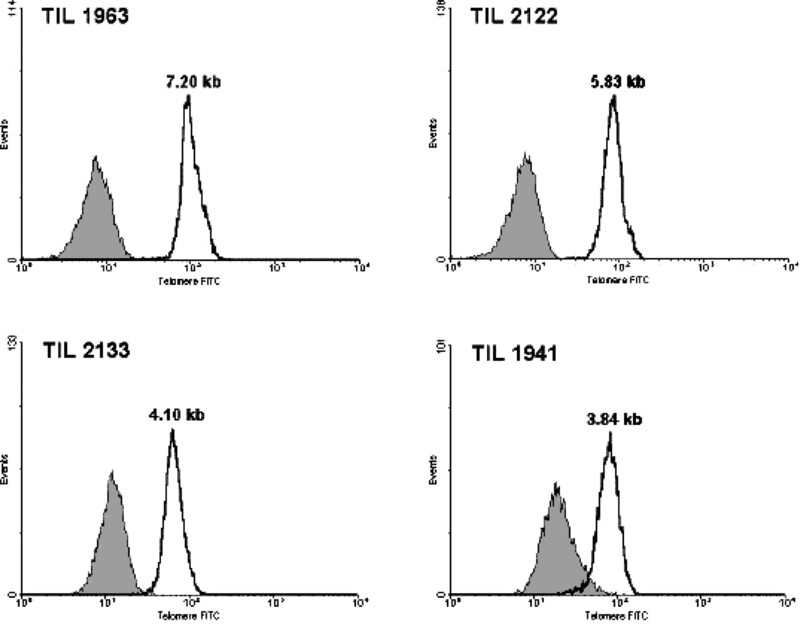 Regulated expression of telomerase activity in human T lymphocyte development and activation. J. Exp. Med. 183:2471.-2479. Weng, N. P., L. D. Palmer, B. L. Levine, H. C. Lane, C. H. June, R. J. Hodes. 1997. Tales of tails: regulation of telomere length and telomerase activity during lymphocyte development, differentiation, activation, and aging. Immunol. Rev. 160:43.-54. Weng, N. P., B. L. Levine, C. H. June, R. J. Hodes. 1995. Human naive and memory T lymphocytes differ in telomeric length and replicative potential. Proc. Natl. Acad. Sci. USA 92:11091.-11094. Roth, A., H. Yssel, J. Pene, E. A. Chavez, M. Schertzer, P. M. Lansdorp, H. Spits, R. M. Luiten. 2003. Telomerase levels control the lifespan of human T lymphocytes. Blood 102:849.-857. Hooijberg, E., J. J. Ruizendaal, P. J. Snijders, E. W. Kueter, J. M. Walboomers, H. Spits. 2000. Immortalization of human CD8+ T cell clones by ectopic expression of telomerase reverse transcriptase. J. Immunol. 165:4239.-4245. Monteiro, J., F. Batliwalla, H. Ostrer, P. K. Gregersen. 1996. Shortened telomeres in clonally expanded CD28−CD8+ T cells imply a replicative history that is distinct from their CD28+CD8+ counterparts. J. Immunol. 156:3587.-3590. Brenchley, J. M., N. J. Karandikar, M. R. Betts, D. R. Ambrozak, B. J. Hill, L. E. Crotty, J. P. Casazza, J. Kuruppu, S. A. Migueles, M. Connors, et al 2003. Expression of CD57 defines replicative senescence and antigen-induced apoptotic death of CD8+ T cells. Blood 101:2711.-2720. Beyersdorf, N. B., X. Ding, K. Karp, T. Hanke. 2001. Expression of inhibitory “killer cell lectin-like receptor G1” identifies unique subpopulations of effector and memory CD8 T cells. Eur. J. Immunol. 31:3443.-3452. Hamann, D., S. Kostense, K. C. Wolthers, S. A. Otto, P. A. Baars, F. Miedema, R. A. van Lier. 1999. Evidence that human CD8+CD45RA+CD27− cells are induced by antigen and evolve through extensive rounds of division. Int. Immunol. 11:1027.-1033. Appay, V., P. R. Dunbar, M. Callan, P. Klenerman, G. M. Gillespie, L. Papagno, G. S. Ogg, A. King, F. Lechner, C. A. Spina, et al 2002. Memory CD8+ T cells vary in differentiation phenotype in different persistent virus infections. Nat. Med. 8:379.-385. Effros, R. B., N. Boucher, V. Porter, X. Zhu, C. Spaulding, R. L. Walford, M. Kronenberg, D. Cohen, F. Schachter. 1994. Decline in CD28+ T cells in centenarians and in long-term T cell cultures: a possible cause for both in vivo and in vitro immunosenescence. Exp. Gerontol. 29:601.-609. Dudley, M. E., J. R. Wunderlich, T. E. Shelton, J. Even, S. A. Rosenberg. 2003. Generation of tumor-infiltrating lymphocyte cultures for use in adoptive transfer therapy for melanoma patients. J. Immunother. 26:332.-342.
van Baarle, D., A. Tsegaye, F. Miedema, A. Akbar. 2005. Significance of senescence for virus-specific memory T cell responses: rapid ageing during chronic stimulation of the immune system. Immunol. Lett. 97:19.-29. Slagboom, P. E., S. Droog, D. I. Boomsma. 1994. 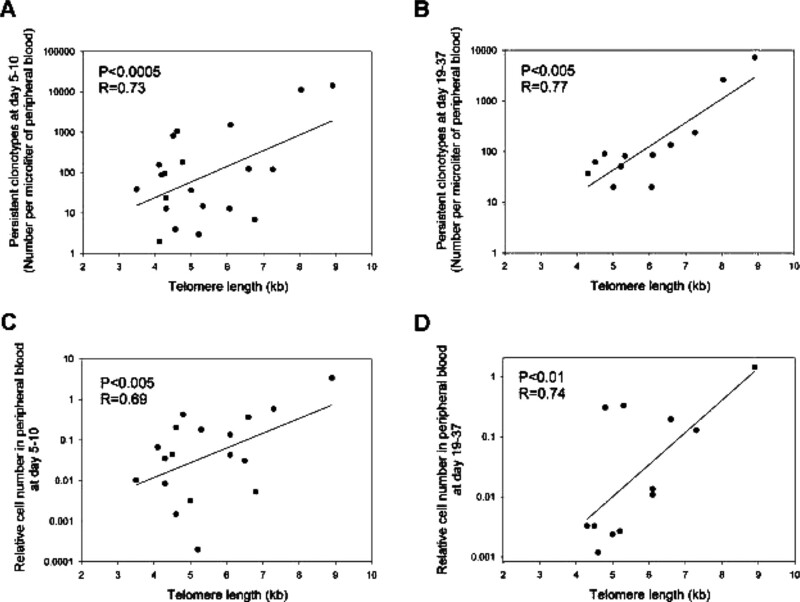 Genetic determination of telomere size in humans: a twin study of three age groups. Am. J. Hum. Genet. 55:876.-882. Rufer, N., T. H. Brummendorf, S. Kolvraa, C. Bischoff, K. Christensen, L. Wadsworth, M. Schulzer, P. M. Lansdorp. 1999. Telomere fluorescence measurements in granulocytes and T lymphocyte subsets point to a high turnover of hematopoietic stem cells and memory T cells in early childhood. J. Exp. Med. 190:157.-167. Cristofalo, V. J., A. Lorenzini, R. G. Allen, C. Torres, M. Tresini. 2004. Replicative senescence: a critical review. Mech. Ageing Dev. 125:827.-848. Rufer, N., M. Migliaccio, J. Antonchuk, R. K. Humphries, E. Roosnek, P. M. Lansdorp. 2001. Transfer of the human telomerase reverse transcriptase (TERT) gene into T lymphocytes results in extension of replicative potential. Blood 98:597.-603. Dagarag, M., T. Evazyan, N. Rao, R. B. Effros. 2004. Genetic manipulation of telomerase in HIV-specific CD8+ T cells: enhanced antiviral functions accompany the increased proliferative potential and telomere length stabilization. J. Immunol. 173:6303.-6311. Valenzuela, H. F., R. B. Effros. 2002. Divergent telomerase and CD28 expression patterns in human CD4 and CD8 T cells following repeated encounters with the same antigenic stimulus. Clin. Immunol. 105:117.-125.